Join us for one of the most spectacular events of the year! We'll turn the Rubix into the "Wynn Las Vegas" and provide a punch, wine, beer, and snacks! 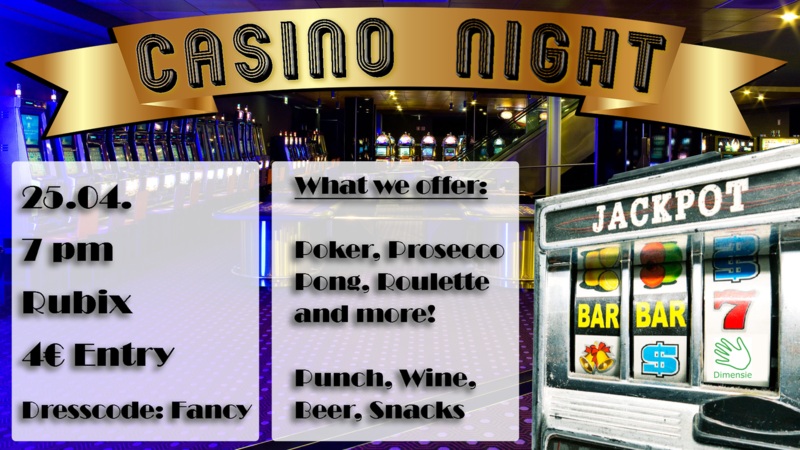 You will receive a certain amount of coins and play several games like Poker, Prosecco Pong, Black Jack, Roulette, and much more - so make the best out of it and become a rich man! The person with the most coins at the end of the night will receive a glorious prize. Make sure to dress appropriately - otherwise, our bouncer will not let you in, so get your suits and dresses out! Sign up is required to make sure to join here! By the way: You do not have to be a professional, we'll explain all the rules and make it as simple as possible.